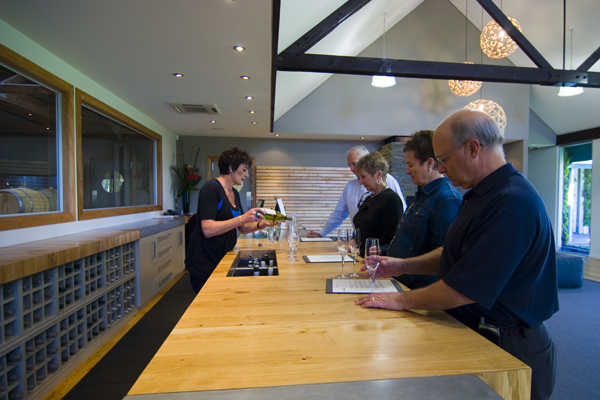 The tasting room at Cloudy Bay. Photo by David Lansing. My favorite wines, like my favorite people, come with a bit of individuality and lot of personality. Like Sauvignon Blanc, a vibrant, herbaceous grape, the most distinctive vinification of which comes from the Marlborough region in the north-eastern corner of New Zealand’s South Island. The winery that really put Marlborough Sauvignon Blanc on the map is Cloudy Bay Vineyards. Situated in a grove of eucalyptus gum trees, Cloudy Bay is ringed by hills on three sides, like a horseshoe, with the northeast opening facing Queen Charlotte Sound, source of cool maritime breezes. I spent the afternoon yesterday with winemaker Kevin Judd, who pretty much created the Marlborough Sauvignon Blanc profile—creamy, intense aroma, and very herbaceous—when he made Oyster Bay’s first vintage in 1985. I’m sure I would have if I had any idea what gooseberry tasted like. Back home we have raspberries and blackberries and strawberries and even Persian berries, but no gooseberries. Not wanting to be disagreeable, I smiled and nodded. Here’s the difference between me and someone like Kevin Judd: I can pick one or two aromas in most wines and he can probably pick out 20 or 30. Including gooseberry. I’m sitting there with the winemaker of one of the most highly regarded Sauvignon Blancs in New Zealand and, as I swirl my wine around and take big sniffs, he’s looking intensely at me, waiting for me to confirm the gooseberry essence of his wine as well as the myriad other aromas that are, no doubt, there, if only I could pick them out. So the question is do I just keep my mouth shut or go ahead and say something that will make me sound like a complete idiot. Kevin smiles and nods but says nothing. Oh well. Time to move on to the next winery, I think.